The application is open until November 1, 2018. The flavor physics community is patiently preparing for the upcoming physics run of the Belle II experiment, which is expected the deepen our understanding of CP and flavor violation. While no signal of new physics has been observed so far at the LHC in the high-energy frontier, a set of surprising - albeit still inconclusive - hints of violation of lepton flavor universality have been observed in semi-leptonic B-decays by LHCb and the previous B factories BaBar and Belle, renewing the interest in flavor physics of a broader community. The goal of this Topical Workshop is to bring together Belle II and LHCb experimentalists and BSM model builders to discuss the opportunities and new schemes for future Belle II measurements in view of the present results from the LHC. 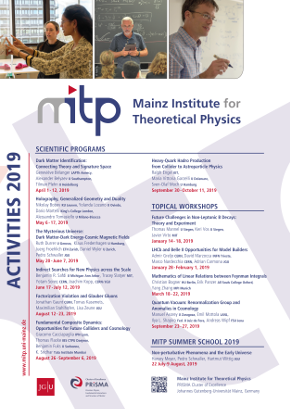 The workshop will have a balanced schedule of theory and experimental talks as well as several discussion sessions to trigger more interaction among the leading experts in the field. The impact is expected on the Belle II community decision-making process about the future search priorities as well as on the determination of future research topics in the theory community. The main objective is to better understand the Belle II potential to uncover new physics.